Capable of reducing Alkalinity, Nitrate, Uranium, Sulfate and is recommended for Industrial Demineralization. A300E is a polystyrene gel crosslinked with DVB (divinylbenzene) anion ion exchange resin. It is a Type II strong base resin supplied in the chloride form. This resin is highly selective for the removal of nitrate in municipal and well water supplies. The A300E resin has been approved by the US Food and Drug Administration for drinking water/food treatment applications. The gel resin beads have a high removal capacity and efficient regeneration properties. Pressure drop remains low and backwashing requirements are minimized. The resin is typically regenerated with sodium or potassium chloride. Nitrate is the most common chemical contaminant in the world’s groundwater supplies. The main sources of nitrate contamination in water are fertilizers, animal waste, and septic tank wastes. The water supplies most vulnerable to nitrate contamination are in agricultural areas and in well waters having a close proximity to septic tanks. Infants under six months of age have a greater risk of nitrate poisoning, called methemoglobinemia (“blue baby” syndrome). Toxic effects occur when bacteria in the infant ’s stomach convert nitrate to more toxic nitrite. When nitrite enters the bloodstream, it interferes with the body’s ability to carry oxygen to body tissues. Symptoms include shortness of breath and blueness of the skin around the eyes and mouth. This condition can lead to coma and eventually death. Pregnant women are susceptible to methemoglobinemia and should be sure that the nitrate concentrations in their drinking water are at safe levels. Some scientific studies suggested a linkage between high nitrate levels in drinking water with birth defects and certain types of cancer. Sulfate is considered a nuisance contaminant that causes taste problems in drinking water. Sulfates are naturally occurring substances that are found in minerals, soil, and rocks and can leach into water supplies. Water with high sulfate can have a bitter taste and may have a laxative effect on humans and young livestock. Baby formula should not be prepared with high-sulfate water. Sulfate minerals can cause scale buildup in water pipes similar to other minerals. Elevated sulfate levels in combination with chlorine bleach can make cleaning clothes difficult. Sulfur-oxidizing bacteria produce effects similar to those of iron bacteria. They convert sulfide into sulfate, producing a dark slime that can clog plumbing and/or stain clothing. Blackening of water or dark slime coating the inside of toilet tanks may indicate a sulfur problem. Water enters the top of the tank through the Fleck control valve and passes downward through the A300E resin. 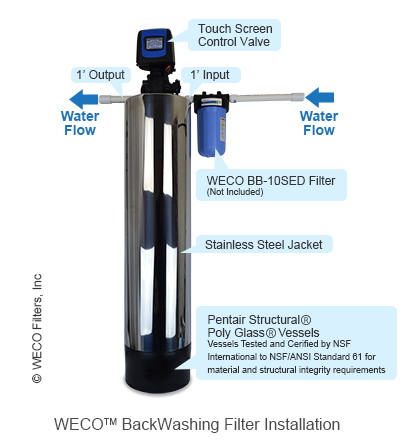 The WECO backwashing filter will clean itself periodically by rinsing away solid impurities that can plug the resin bed. The control valve automatically starts the backwash process. The backwash procedure is an operation where water passes backward through the filter media at a fast flow rate. It enters the tank at the bottom through the riser tube, then flows upward through the filter medium, exiting at the control valve and sent to waste. The rapid, turbulent upward waterflow, in addition to flushing away particulate matter, loosens and resettles the media bed. A regeneration cycle flushes the resin bed with brine to strip off nitrate (or other anions) and load the resin’s exchange sites with chloride ions, preparing it for another filtration cycle. The treated and conditioned water enters the riser tube at the bottom of the mineral tank, passing upward and exiting the filter through the control valve.